Our very Full House: *Yay* for Colin! and is now READING three and four-letter words?!? Colin--I'm so proud of you buddy! OH Dev,I just laughed out loud on that one! I so love the office! did you see the new one tonight!!!! OH MY!!!! I DIED! Way to go big guy!!! What a stud! Good job, to both Colin AND Mommy! 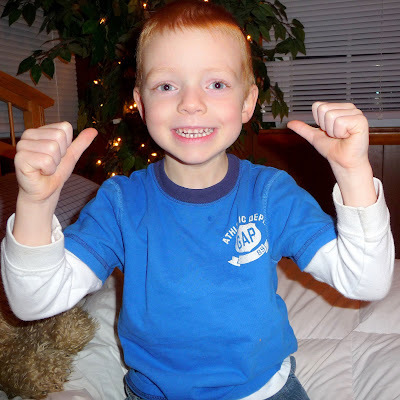 Who has two thumbs and Hates Todd Packer?! awesome! tell me how you did it, i have been working with caden using this website starfall.com and so far so good, he wants to read, but just doesn't quite have the attention span and patience yet! Wordless Wednesday: "Mr. *Potato* Head"
"I think I need bigger onesies, Momma."